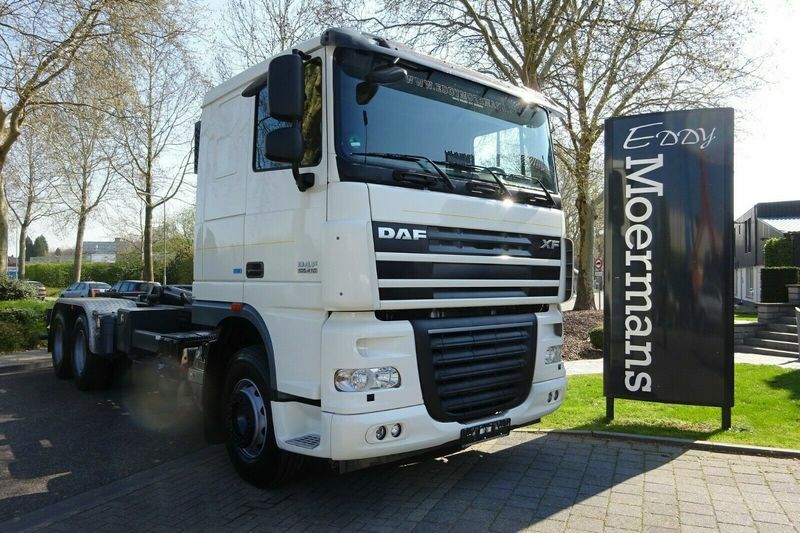 Used hook lift truck DAF XF 105.410 6x4 Neu Bereift for sale by Eddy Moermans Handelsonderneming b.v. Check the technical data of the unit, picked out from the catalog of DAF XF 105 hook lift truck. Eddy Moermans Handelsonderneming b.v. offers excellent transport solutions for business and individual needs. Engine/driveline: Euro 5, diesel, 408 hp, gearbox: manual. Chassis configuration: 6x4, number of axles: 3, ABS, EBS, trailer coupling. Cab design: cab type: sleeper cab, air conditioner, parking heater, cruise control. Body: loading length: 6000 mm.